Note to food scientists: hydroponic tomatoes? They smell like cat food. Work on it. Why don't I own any MGMT or Destroyer albums? What is the remedy? If I had more expendable income, I'd buy more expensive beauty products and condiments. I'd replace my underwear, gym clothes, towels and bedding more often. I'd get some new nonstick cookware since most of ours is scratched up and probably killing us. Things I would not spend it on: gadgets/AV equipment/appliances/an iPhone/a Wii. Some things I would probably not buy, but would enjoy receiving as a gift: a seltzer maker; a bar (as in the furnishing, not a going concern); a massage; a ficus; a subscription to The Believer; this video lecture series on the wonderful world of mathematics or what have you that is sometimes advertised in Harper's. I sold my car! I'm going to miss old Joaquin, but I'm really happy to scratch something off my mid-term to-do list, which remains otherwise unscratched. (Happy, also, to have the extra cash and stop paying for insurance.) Among other to-do items, I want to finalize acceptances for the next issue of Absent within a month or so if possible. I'm looking for about five more selections before I close submissions; I've got a lot of maybes and some still unread stuff. Last night we saw Orphans, the "feature film debut" of a young filmmaker named Ry Russo-Young (younger than me, anyway; I pretty much consider anyone born post-1980 to be a child). It's about two sisters with a fraught relationship; the younger, artsy, city-dwelling one, Rosie, goes out to visit the older sister, Sonya, in the country for her birthday. Sonya lives in the house they inherited from their parents. There were a couple other heavy-handed moments, like when Rosie smashes their childhood dollhouse. We get it, geez, shattered dreams. Overall though, worth seeing. But I'm always extra-affected by sibling movies (e.g., Hilary and Jackie, You Can Count on Me), because my relations with my own sib have their share of fraught. We're off to a house-warming party. I'm pleased that proper pre-summer weather has returned to greater Boston. Tomorrow: thoughts on Susan Boyle? Maybe. At least they didn't use the word "shrill"
* Ryan Manning interviewed me on Thunk. Thanks, Ryan Manning. * Nathan Logan reviewed That Tiny Insane Voluptuousness. Thanks, Nate Logan. Surprise, surprise, Sotomayor is getting Hillary Clintoned. "Testy"! I love the NYT's very carefully veiled sexism here: she is "not shy about" and, later, "not afraid of" asking lawyers a lot of questions—not so much to keep them honest and on their toes as to "ensure that she fully understands their arguments." Read: women are shy, scared, and dense. I can never believe when people say they don't like summer because it's too hot. Probably the same crazy assholes who like shoveling snow. (Just kidding. I kind of like shoveling snow.) I like summer so much that before it even arrives, it's already half-ruined by my dread of it ending. Like basically the only part of "summer" that isn't tainted for me is the first 20 days of June that are still technically spring, because I think, "This is so great, and it's technically not even summer yet!" The summer solstice marks my inward turn toward despair and hopelessness. Trudging around, hungover and sweating and chewing on the straw of my watered-down iced coffee getting cancer. Look, I know unpopular people with math/science inclinations stole the word from chicken-head-biting circus freaks in the first place, but don't they kind of own it now? Whether or not Wil Wheaton is an "exclusionary geek elitist," I have to agree that having a blog/using Twitter/reading Gawker/liking Wii does not a geek make. If this is the society for geek advancement, why does the video spend so much time dissociating itself from perfectly respectable geek activities like "gaming"? It's not like a race or a nationality where you can wear the term without exhibiting any of the stereotypes. If you don't participate in the activities associated with geekiness, by definition you're not a geek. This video does not argue for acceptance of geeks in the mainstream, it argues for thinking of Ashton Kutcher as tech-savvy even if he doesn't know HTML. I feel like famous/hot people just LOVE making faux-humble claims a la "I'm a huge dork!" Britney Spears used to do that all the time before she had a crack baby. It's like, No, Britney, Justin Timberlake doesn't date dorks. The Britneys and Julias of the world could never, ever hang with actual, for real geeks. We're not talking geek-chic fetishists in short pants and undersized cardigans, we are talking about people whose clothes are legitimately out of style. We are not talking about people who like to use software, we are talking about people who like to write software. I'm not saying that one variety of person is better than the other (I am not myself a true geek, though I enjoy them), I'm just saying there's a distinct difference, and the above video is basically a huge insult couched as promotion. Maybe you like it because it's bad? Among the "hundreds" of blogs I read are sister sites Overcoming Bias and Less Wrong, whose taglines are, respectively, "on honesty, signaling, disagreement, forecasting, and the far future" and "a community blog devoted to refining the art of human rationality." Funnily enough, these bloggers and their followers tend to display deep, unexamined sexism, but when nothing too flagrant is going on, I quite get off on this brand of cold hard rationalism. Today at Less Wrong, the question: "Do Fandoms Need Awfulness?" I.e., does a thing only inspire truly rabid fandom if it's in some way or from some angle grandly bad? The examples given include Star Wars and Tolkien (crazy fans) and Shakespeare and The Well-Tempered Clavier (generally accepted as excellent, no insane fan base). The idea being that if the art work or artist in question has virtues but also serious flaws, fans must be highly defensive and fiercely loyal to deflect criticism. I like this question for the same reason Eliezer Yudkowsky does: It gives one pause by virtue of being both plausible and unpleasant. But, he says, "Just because it's unpleasant doesn't mean it's true." But there are a couple of other ways to look at the question, both brought up in the comments on the post. One is that more obscure or esoteric things garner more intense fan bases. It's not that they're bad, just that fewer people see the virtues. This would explain why so many things sci-fi are fan-tastic. Science fiction has a narrower appeal than, you know, action movies. If being a fan is a kind of signaling, you have to signal louder to find the other, fewer and farther between fans. So Shakespeare wouldn't need crazy fans, since Shakespeare lovers are more widespread. I like this argument ... but again ... I'm not sure I don't know more Star Trek fans than Shakespeare lovers. And that's not self-selecting either, because I kind of hate sci fi, and I'm a poet. The other idea is that the theory gets it backwards. It's not that people are more likely to go wacko for things that are kind of bad, but that fans are annoying, so when anything has a wacko fanbase, people are spurred to be extra-critical of the object of their fandom. The example here is Apple. I admit to being wildly annoyed by Apple/Mac people, who seem like the worst kind of image-conscious suckers for marketing to me, and I admit to looking for flaws in Apple's products to further justify my opting out. Luckily, one really need look no further than "overpriced." Another counterexample in the comments was sports teams, which tend to have more fans the better they perform, of course. But I sort of feel like sports fans are a different animal entirely than fans of a book trilogy or band or what have you. More on the pervasive, unpleasant-but-true nature of signaling to come. Mark left this comment earlier today: "Hearing about what people are eating is okay. But one thing I'd really like to hear on this blog from time to time is more advice about what people should eat--that is, should want to eat. And if somehow you were able to compare certain foods to certain poets, that would only be icing on the cake, as it were." Eggs poached in tomato sauce AKA "eggs in purgatory." Pastured eggs, if you're rich or live on a farm. They're like twice as nutritious, and have a taste. Chopped up eggplant and canned tomatoes w/ whole garlic cloves, red pepper flakes, salt, and olive oil (don't be stingy), roasted for an hour. Good on crackers or tossed with pasta. Salt & vinegar potato salad. Arugula and bread salad w/ mustard caper vinaigrette. Bread salad in general. Chris Tonelli's wife has the best recipe. Champagne mangoes, the superior mango. Fermented foods, e.g., pickled vegetables and yogurt (not together). Not crappy American yogurt either. Chocolate chips and dried cranberries (together). Add almonds or whatever if you're a trail mix purist. Now, for poet-food comparisons, the A edition. Anne Carson is like stuffed grape leaves. Simple, classic, and yet, not really for kids, for whom leaves, like crusts, are best neatly disposed of. It's really hard to find an appetizing image of grape leaves. They're better than they look. August Kleinzahler is like sausage. Men like to brag about how much sausage they ate; male poets read Kleinzahler and are similarly self-impressed. On the other hand, almost any image of sausage will do. Adam Clay is something kind of "classy" and well-liked and not too heavy. Sushi maybe? Or like a canapé or cocktail snack, like a cheese puff or an asparagus spear you dip in herbed mayonnaise. Something like that. I just realized I'm doing this backwards. Mark asked me to compare foods to poets, not the other way around. Probably not to be continued in any case. That made me feel kind of racist. Hey Kathy & Martin could you guys buy this please thanks. I think it's funny (not funny ha-ha, but funny wrong) when detractors pooh-pooh blogs and Twitter on the basis that they don't care what you ate for breakfast or whatever other blow-by-blow details of your meaningless life. Because I love knowing what people are eating, reading and so forth. I just ate some leftover quinoa with roasted asparagus, cherry tomatoes, garlic and feta. See? What's not awesome about that? It feels a bit soon to say I'm reading To the Wedding, since I'm only on page 5, pre-threshold-of-abandonment. But I did start it. It always takes me like 20 minutes to read the first 10 pages of a new book. I think I'm afraid I'm going to miss something important. I was dreading setting up a blogroll because I literally read hundreds of blogs. I didn't want a Silliman-style list that takes ages to scroll down, but nor did I want to pick and choose favorites. Also, the last time I set up a Blogger blog, I had to cut and paste the names and URLs into a little window and it took forever/was generally a pain. Now you can just import your blogs from Google Reader! YAY! Also I set it up so only the ten most recently updated show. Hell to the yes, is it possible that craptastic free blogging software is improving marginally over time? I'm willing to entertain the idea. UPDATE: Shortly after posting this, I refreshed my browser and the post disappeared. 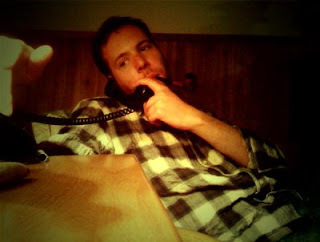 This picture was supposed to look old-timey (pipe, rotary phone) but pretty much looks like classic John with a 10-day "beard," no? Setting: The Cotters' beach house in Waterford, CT. Photo credit: Shafer "Tipsy" Hall. Is this thing on, etc. My characteristic self-involved bitching will continue here, but now I can expand the reach of it beyond the literary to other stuff that occupies my time, like food (cooking it, eating it), fashion (buying it, wearing it), science (pretending I know more about it), etc., and also generally get confessional and promotional about myself and my friends, without worrying about whether it serves Ploughshares and its readers, which it mostly won’t. So if you liked me before … you probably know me and I assume it’s unconditional. Don’t be a stranger.